Five years ago, we welcomed our baby boy! Becoming a mom was wonderful, amazing and totally rocked my entire world…in so many good (and a few unexpected) ways. I remember those first few days, sleep-deprived, emotional, hormonal… I felt like I'd cashed a huge reality check. I quickly realized my visions of leisurely shopping with my baby—my hair and makeup together, all dressed up with my baby cooing in a stroller wearing tiny adorable outfits…well, it just wasn’t realistic. Like, not at all. We spent those first few days in serious survival mode. Of course, looking back, I wouldn’t change it for the world. SO, by the time baby #2 came along, we'd wised up about the details of what a baby actually needs. (Newsflash: it's not 400 outfits, toys and adorable baby shoes.) What babies really need is your time, attention and patience. As new moms, separating the MUST HAVES from the way-cute-but-don’t-needs is often tough. 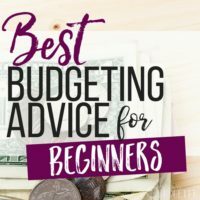 If your budget is tight, the last thought you want your exhausted brain to think is about finances…so let's talk budgeting for a baby. If you’ve got a baby on the way, you’re probably overwhelmed by the sheer amount of details, new terms and crazy information you’re learning. Do you have a birth plan? Do you need a doula? Do you have a Boppy? What the heck IS a Boppy? It’s a lot to take in. Not to mention, there are tons of people with opinions on what you should and shouldn’t do. It gets overwhelming. Budgeting for a baby is QUITE unnerving. Like, should you just burn your budget? Because sometimes that’s what it feels like with hospital bills, insurance and supplies. Well, from my experience there are simple ways to budget for a baby that won’t break the bank. Babies are tiny little people and honestly, they really don’t need that many “accessories” to survive. Pare down to the basics, do a little planning and you’ll be fine! Having a baby is one of the best times in your life. Even though you’ll experience a lot of information overload, having a baby is an amazing, joyful, awesome experience. So, don’t forget to step back and enjoy it (and if you’re not enjoying it yet, that’s totally okay too). Give yourself a break—you’ve got this! When you’re anticipating a new baby (especially your first) you feel like, “Oh my gosh, I need to buy everything!” There are tons and tons and TONS of baby items out there and let me tell you—it’s all adorable, cute and won’t get noticed at all by your tiny new arrival, who will be completely oblivious. Babies really need very few items to get started. In fact, most babies need very little more than what mom provides. Your being able to take a few months (hopefully three) off, is really the most important goal and the best option to bond with and care for your baby. Focus on what YOU need to do to take care of yourself. You are your baby's main source of care, comfort, and even food if you plan to breastfeed. Get yourself a Boppy (which, for the record is a curved pillow MADE for breastfeeding). Plan on comfy clothes. Prepare and freeze meals ahead so you don’t stress about cooking. Take care of yourself. Ask your fam for extra help. Give yourself plenty of breaks and slack. Pro-tip: Buy only what you need. Don't stock up on anything until you get more familiar with your baby and your new routine. Diapers: Buy only a box or two of the tiny-size beforehand. If your baby grows quickly, they may only fit in them for a very short time (a 10-11+ pounder might not fit in them at all). Cloth diapers are another option you may want to explore, but again, it’s best to feel the situation out before you purchase a whole bunch only to discover the diaper method you chose doesn’t work for you. Wipes: Most wipes are largely the same. Buy them in bulk at Costco or Sam’s Club and look for a generic type. You may want to go with unscented if you plan to stock up—again, if your baby is sensitive to scented wipes it’s a pain if you’ve got cases of them on hand. Bottles: If you’re breastfeeding you may only need 4-5 small bottles to start. If you’re feeding your baby formula, you should purchase a few more. Again, babies are picky and there are several styles out there, so don’t buy too many. If you aren’t sure, ask friends and buy a few “tester” bottles. When you discover what your infant likes, buy a few more. Breast Pump: Fortunately, many insurance companies and hospitals offer free breast pumps to encourage and help new moms with breastfeeding. If you plan to breastfeed, check your insurance benefits to see if a pump is covered. It will really save you money. Pacifiers: Again, these come in several different styles and it’s hard to know which one your baby will prefer. (Sensing a pattern here?) So, hold off buying a whole bunch until your bundle arrives. Then, buy one or two to test. (Keep in mind, some babies don't even like pacifiers.) If your baby does, it’s useful to buy 4-6, as they will need sterilization and they get lost. Rags & Burp Cloths: Some babies spit up a lot. Some have pretty calm stomachs. It’s safe to say, if you’re doing a load of baby’s laundry every few days (baby laundry is often washed separately, so you might not do a load every day), half a dozen burp rags are usually enough. If your baby is colicky, you may need a few more. Similarly, 6-10 bibs are plenty. Swaddle Blankets: Babies love to get swaddled to sleep. Swaddling helps them feel secure and safe. You’ll need about 6 swaddle blankets (but err on the side of fewer, until you really use them). When working on your baby budget, those are the basics. 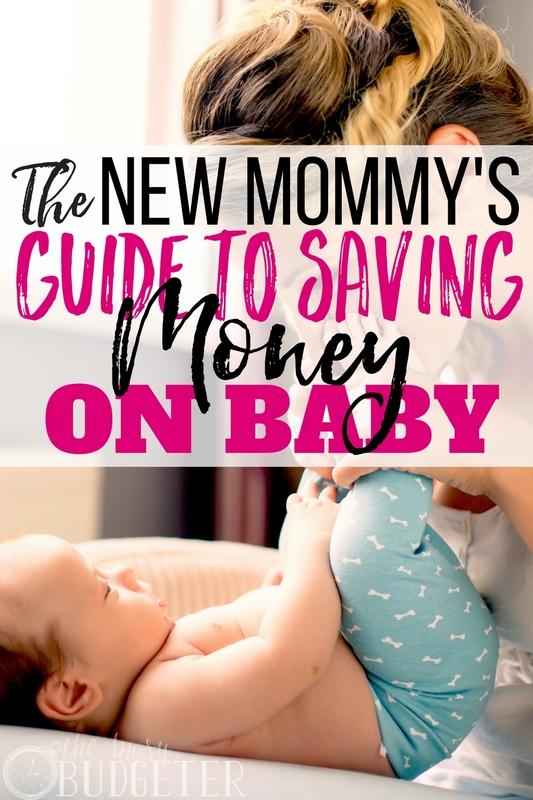 Of course, there are a few additional items, which we will get to, but if you need to save money on your new baby, this is plenty to get started. Babies and kids grow fast. Way faster than you may anticipate. This means there are loads and loads of gently used baby items out there. Many of these items were barely worn and outgrown before their original owner put any wear and tear on them at all. These items are literally like new. I know moms feel strongly about second-hand stuff for babies, but really, they grow so quickly it’s very hard for items to get ruined or worn out. Many baby items are durable and made to withstand much more use than they undergo. This works out to your advantage if you’re budgeting for a baby. Check out the free section of your library, where neighborhood members list items they’re selling or giving away. Look at your neighborhood email, check the Mom groups on Facebook, especially local and even look at Craigslist. Thrift stores are an awesome resource too. You'll find amazing items for a fraction of the original price and many are like new after a quick cleaning. Yard and rummage sales are also worth checking. Brainstorm what you need before you shop and jot down a list. Even if you find a great baby gym at a garage sale, you only need one (not three). So, if you already own the item, let another mom find that treasure. Swings, seats and fun items are great for older babies too—it’s okay to buy ahead, but use restraint when stocking up. Your toddler won’t play with three mini-bikes and a Barbie Jeep. Pick only what you’re most excited about and really need. One note: I’m actually a certified car seat inspector and I’ll tell you, car seats are one area where you shouldn’t buy second-hand. A good quality car seat should be at the top of your baby budget. The seats are often recalled and even have expiration dates. In most cases, you can get a car seat for around $60. If the cost is financially prohibitive for you, there are several community resources to help. Check with your local mom groups, municipalities and even the hospital where you give birth, they will provide you with resources on car seat safety. It's absolutely worth it. Some items for babies are SO silly. Wipe warmers?! You don’t need a wipe warmer. Hold wipes in your hand for a second (store them at room temperature), your baby will be fine. Being a mom is a little scary, even if you love it. The prospect of being responsible for a tiny person is a huge deal. So, of course every new mom worries about doing it right. Every mom wants to ensure she’s not freezing her baby’s little tush off or making her uncomfortable. It’s totally normal to worry. Retailers KNOW how worried moms are and they use worry to sell a lot of products you don’t need. There are lots of “extras” that don’t really increase your baby’s comfort or actually make your life easier, but it’s easy to sell baby items to moms. Plus, let’s face it—tiny baby items are adorable. Who doesn’t want to buy sunglasses, tiny jelly shoes or ridiculous accessories for their infant? When budgeting for a baby, resist the urge to over-buy. You don’t need 80 blankets. You don’t need specialized “girl clothes” and “boy clothes.” If you buy a size up and opt for gender-neutral designs, you’ll extend the life of your baby’s clothes quite a bit AND you’ll end up with plenty of items to use again if you have baby #2. Okay, as far as toys go—babies don’t need toys. It’s harsh, I know. But really, I promise your baby can’t play with the toys and won’t need them at all until they’re at least five months old. At five months, they start exploring toys with their mouths and a few blocks or rattles are interesting. Quite honestly, though? Your baby might find Tupperware lids and household items as interesting as any toys. Having a gym with dangling toys will keep a baby entertained and a set of chewie “keys” or teething toys are helpful, but really, those are all you need from the “toy section.” Babies are fascinated with YOU and with the world around them. As long as you’re playing, cooing and talking to them, they’re just as happy. When you’re buying big items like a highchair, crib or pack & play, look for items to grow WITH your baby. Go for a convertible crib to later turn into a toddler bed. There are rock & plays and pack & plays out there that will work for your baby until they’re toddlers. You can easily change your baby’s diaper on a towel or blanket on the floor, rather than investing in a changing table, if you need to. A stroller can have a detachable car seat and baby carrier so you can bring your infant right along with you easily (and don’t need to invest in all kinds of equipment). Look for highchairs usable for longer periods of time to grow with your child. Feed your older baby in a Bumbo chair or bouncy chair, which you can also use to encourage play. Prop up new sitters with your Boppy pillow you use for breastfeeding. There are tons of products to do double-duty and help you stretch your investment. Again, buy items in neutral colors you can live with for a while. Buying all pink princesses or all blue trucks and superheroes might present a challenge if you plan to re-use items for another baby. Of course, girls are superheroes and love trucks too and boys might get totally into princess stories. But you’ll probably end up getting more use out of gender-neutral items. Being a new parent is a big deal! It’s amazing, awesome and wonderful. It’s also challenging, overwhelming and sometimes intimidating. The last issue you need to stress about is finances. Use smart strategies when you’re budgeting for a baby. Buy only what you need and worry about the rest as time goes on. Babies mostly need time with their mommy, attention and of course, love. If you have those items on hand (which you do), you’ll be all set! What are the most important items you needed for your new baby? Did you discover there were items you bought but really didn’t need? How did you make your baby budget happen? We have three kids and after our first we learned how many of those “essential” baby items are a complete waste of money. We registered for so much stuff because that’s what everyone else does but most of it just took up space. Diapers, onesies, and practical clothes and PJs are most important when they’re really young. The other item we couldn’t live without was a bouncie chair. Not essential if you’re on a budget but it was a lifesaver for us because it helped soothe the little ones and give us a little bit of a break. Congratulations on making your “side hustle transformation,” from a former state trooper to a full-time blogging mommy. How long did it take you to get your blog off the ground and make money online before quitting your day job in law enforcement? Thanks for this! As a mom of three (with no babies anymore) I do have one suggestion. You mentioned baby laundry being done separately. In our home, we have one with sensitive skin and we use natural laundry products. So for us, we did all of the laundry together anyway. I think it was a simpler that way! 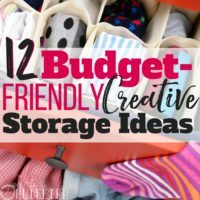 Having three young kids, and cloth diapering, we did laundry almost every day, which meant buying fewer baby items. Yes! I’m due 4 weeks from today and this post came exactly when I needed it. It’s so hard to know what we should buy and what we shouldn’t. I love your advice. I’ve also ended up getting a ton of baby stuff for free during my pregnancy. Pump like you mentioned, but also lots of samples (like diapers, wipes, bottles, pacifiers, etc.) just by creating lots of registries and signing up for things. Oh, and so much free formula just by signing up online (just in case I have to supplement). I think we tend to overbuy because we’re so afraid to be unprepared when baby gets here. It’s so true that most things can wait. After all, 2-day amazon shipping can always save the day if we do end up needed something, right? These are great tips. With my first, I definitely bought way too much stuff. Didn’t even use most of it! Baby number two got only the basics, and it was so much better! No useless junk getting in the way. 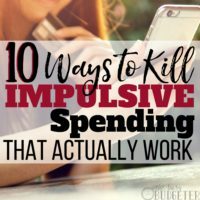 This is a great article about budgeting. 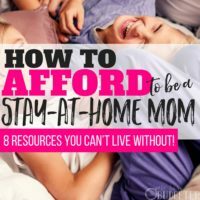 I have two kids, so I’m not exactly a new mom, but the tips still resonates with me. We bought all kinds of useless stuff the first time around, and downsized the second time around, when we were wiser : ) Anyway, excellent advice! Thanks for the tips! I usually went overboard with my baby’s stuff. This post some part figure what to buy and what not.